Where Exactly is “Southwest Florida”? 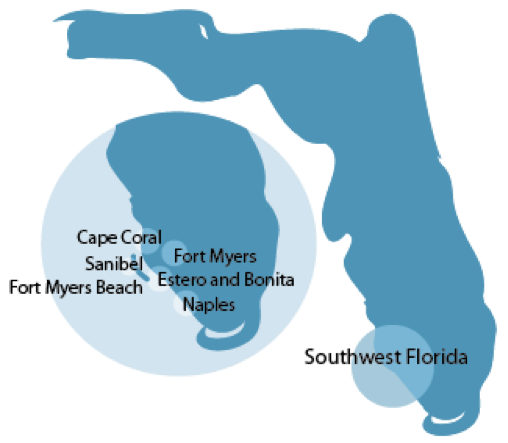 Southwest Florida primary cities are: Cape Coral, Fort Myers, Fort Myers Beach, Sanibel, Bonita Springs, and Pine Island. Southwest Florida features unspoiled beaches, exotic wildlife and lush subtropical foliage. The perfect combination of the sophistication of a pampered island resort with the relaxed style of Old Florida. Our area is served by the Southwest Florida International Airport in Fort Myers (Lee County), with direct flights from Toronto, Munich, Minneapolis, Milwaukee, New York City, Memphis, Dusseldorf, Indianapolis, Washington DC, St. Louis, Cincinnati, Boston, Chicago, and many more major cities in North America and Europe. Alternatively, the smaller Punta Gorda airport hosts Allegiant Airlines – from many smaller cities in the US. St. Pete- Tampa is just a two and a half hour drive. It’s well known that the closer a property is to water, the more valuable the property becomes. This is especially true if the weather, the shopping, and the related community services are superior as well. In consideration of all factors including amenities, affordability, Gulf of Mexico access, and opportunity for growth and appreciation, Southwest Florida real estate offers a solid opportunity for investment. Punta Gorda is also known for its expansive canal system and beautiful views over Charlotte Harbor. However, if BEACHES are your thing – Punta Gorda is quite a drive! The other distinguishing difference is in the Punta Gorda Isles subdivision’ they have a homeowner’s association with rules, dues, and they OWN their canals and must pay when dredging is needed. The city of Cape Coral owns the canals in the city, and regularly maintains the center of all canals to a minimum of 5’. Perhaps the best tarpon fishing in all the world lies just north of Bokeelia (Pine Island), in Boca Grande Pass at Charlotte Harbor. You can frequently see former President Bush taking advantage of the fishing here. Other popular game fish are snook, redfish, trout, grouper, snapper, cobia, and sheepshead. A fisherman’s paradise! According to the National Golf Foundation, Fort Myers ranks fifth in the nation for golfer-to-holes ratios. More than 975 holes perforate more than 60 golf courses throughout the county, 27 of which are open to the public. Those in Southwest FL real estate market are in a perfect position when it comes to cash in on the second-home market surge, when compared to other Florida areas. As value-conscious baby boomers join the bandwagon and look to purchase second-homes/vacation-homes, they will look to purchase in communities where they can enjoy affordable resort style living and get the most for their money. For example, according to the US Census an average of 20,700 people move to Southwest Florida – Lee County (Fort Myers, Cape Coral, Sanibel/Captiva) – annually. U.S. Housing Markets has ranked Fort Myers-Cape Coral as the number one housing market in a metropolitan area for two years running. The Fort Myers-Cape Coral MSA consistently ranks as one of the top 10 metro areas in this index. People buying Southwest Florida real estate find the composite cost of living is consistently at or below the U.S. average. (ACCRA Cost of Living Index, which measures relative price levels for consumer goods and services in participating areas). For example, New York’s composite score is 215.0, while Southwest Florida is 101.7. Chicago’s composite score is 131.1. While exploring Southwest Florida real estate, you’ll discover many and varied recreation and entertainment opportunities. Gulf and freshwater fishing, boating, golf, tennis, parks, Twins and Boston Red Sox spring training, and more! The Barbara Mann theater has Broadway caliber plays and productions and many other cultural arts abound. In Cape Coral, our New Resident’s Club helps newcomers make friends quickly and get involved in activities and hobbies that match interests. Other factors; such as great health care systems, local shopping, government services, and no state income tax… add up to a lifestyle choice that is hard to beat.